I’m not sure how it came up, but the other day my husband mentioned steak. We rarely eat red meat in Israel, not so much out of health concerns but because it’s pricier than poultry and tofu, and because even when we go out it’s hard to find a decent burger. I also haven’t taken the time to familiarize myself with the cuts of beef readily available here. I rarely grow tired of all the amazing things that can be done with chicken, turkey, tofu, and vegetables but suddenly a thick, juicy steak was on my mind. So I went to the grocery store and picked out the biggest, nicest looking steaks I could. When I came home I was able to do a little reverse research and learned (with the help of Google Translate) that I had bought a boneless chuck shoulder center cut steak, more glamorously known as Ranch Steak. I learned that it’s a flavorful, but slightly tough cut that is best cooked low and slow or quick and rare. I was hungry, so quick and rare it was. To help tenderize it I let the meat sit in a quick marinade of soy sauce, Worchestire sauce, and garlic, inspired by my in-laws’ preparation for grilled steaks. I seared the steak over high heat, cooking it for about 8 minutes per side until it was nice and charred outside while still rare in the middle. Knowing when steak is done can be tricky, but after a while you get the feel for it, literally – it should feel like a loose fist when pressed. Try it. Allowing the steak to rest is crucial for the best possible end product; for a really in depth look at why, check out this post on Serious Eats. My father always serves steak with sauteed onions and mushrooms, and I am my father’s daughter, so while the steak rested I sauteed onions, mushrooms, garlic, red wine (marsala would also be excellent), and butter (omit this to make it kosher meat). The steak was flavorful and tender (not in a filet mignon way but in a skirt steak way) and the mushrooms and onions were the ideal accompaniment. I served the whole thing with garlicky broccolini and sour cream and scallion mashed potatoes (recipe to come shortly). A nice glass of full-bodied red wine and you’re all set. Perfection. A quick marinade tenderizes the steak and adds extra flavor while the onions and mushrooms are cooked in the pan juices along with red wine and garlic for a delicious special occasion or weeknight meal. This steak would also be fabulous on the grill. Combine the soy sauce, Worcestershire sauce, and 6 cloves of minced garlic in a large bowl. Add the steak and allow to marinate at room temperature for 30 minutes, or covered in the refrigerator overnight (bring to room temperature before cooking). Heat a little olive oil in a skillet (cast iron would be perfect) over high heat. Add the steak and cook about 8 minutes per side, depending on thickness, until the outside is nicely charred (not burnt) and the steak feels like a loose fist to the touch, or registers 125-130F on an instant read thermometer. Remove the steak from the pan and loosely tent with foil. Allow to rest. Meanwhile, melt the butter (if using) in the pan along with any juices and add the mushrooms, onions, and remaining 3 tablespoons garlic. Cook, stirring frequently, until softened. Add the red wine to deglaze the pan and scrape up any bits from the bottom of the pan. Allow to simmer for a few minutes until liquid is mostly absorbed. Remove from the heat. Either serve the steaks individually topped with the sauteed onions and mushrooms or slice the steak and serve the onions and mushrooms on the side. I can taste this in my mouth right now!!! Yum! Looks amazing! Thank you Katie!!! It really was tasty and flavorful. It tasted like a special occasion meal even though it was a weeknight! I would like you to come over and cook this for me, please! I have no luck with steaks. OK! I wish we were going to be in NY at the same time!! Miss you guys! This looks amazing! I’ve actually never had a ranch steak, just because ranch isn’t popular in Germany. Man, my mouth is watering! Thank you Kiri! I don’t know that I had ever had a ranch steak before, or maybe didn’t know what it was called. Either way, it was delicious! And pretty much any steak can be subbed here. Thank you Theresa! HA that’s awesome. Ohhhhhh my mouth is watering! I haven’t had steak in a while too… it is still to hard for my girls to eat, so I rarely make it for my husband and I (even though we both LOVE steak)! Maybe now that my parents are here I could make some! Yours look delicious and I am also looking forward for the mash recipe… love mash!!! Yeah I just got the hunger! Suddenly it was all I wanted 🙂 Hope you get to have some soon. Mash recipe to come tomorrow – it’s my favorite too! This looks fantastic! I only started to “like” mushrooms and onions in the last year, so I still haven’t had them with a steak… but your steak makes me think that I better get on it soon! Katherine this looks amazingly good. I’d have to do it sans mushrooms though. But steak for me is one of my fave things to indulge in. Thanks Kim! The steak is great on it’s own too, or just with onions if mushrooms aren’t your thing! I love a good steak, for some reason here it’s just pricey and not that great. But I think I found a cut I can rely on! You have an amazing lens to make even a brown coloured dish look so tempting! Love the sautéed mushrooms along with the steak. Thank you!! For this photo I used my 50mm lens (which on my crop sensor camera is more like an 80mm). Although I have to manually focus it, it takes sharp photos and is not that expensive for a lens fyi (around $100). The sauteed mushrooms are so good with the steak! I really think you have good photography skills – just like someone above said, it’s very hard to take brown picture, especially steak picture to look like it’s delicious. And you totally nailed it!!! This looks really delicious!!! Aww thank you Nami!! I was so happy the photos came out because I didn’t take that many – I just wanted to dig in! Your pictures here are very enticing! A delicious steak is always a welcome sight in this house. I really like the ingredients of the marinade and the topping is just a great bonus. Wonderful meal-yum! Thank you Tina! I was really craving steak and this hit the spot. The marinade is easy and flavorful. Your photos look fantastic, considering how hard it is to photograph dark coloured foods. I’m sure this must have tasted just as good as it looks :). Thank you Divya! It was pretty good and sated by steak craving! Beautiful photos! Now I want meat for dinner. Thank you Lynda! Haha, same thing happened to me – as soon as the idea of steak got in my head I needed it! Thank you Ewa! It is so interesting how the body responds to pregnancy! Hormones are powerful stuff indeed. We don’t eat a lot of beef either, but when we do we opt for a juicy steak or GOOD hamburger. You cook your steaks like Bobby does (he does all the steak cooking) – quick and rare. Yours look fabulous! Love the mushrooms on top! We are the same way! A bad hamburger just won’t do – and for some reason Israel just can’t deliver a good one, at least in my book. Sounds like Bobby and I would get along! I guess medium-rare would be a more accurate description, but definitely not well done! Looks delicious Katherine! Congrats on Top 9! Mmmm, steak! It’s been ages – over a year, at least – since I’ve done one. I don’t often do ranch steak, but when I do I like to cut it in slices on the bias – kinda like London Broil – which helps if the meat is at all tough. It’s also a sneaky way of getting more servings out of the same amount of meat! People usually don’t eat (or want) as much when you serve it sliced like that, I’ve found. Really nice light on the steak and mushrooms. Isn’t 50mm a great focal length for crop cameras? At least when it comes to food photography? I use that all the time. It had probably been at least six months since I cooked steak! Cutting the steak on the bias is always a good trick. I never thought about how it curbs serving size too – good point! And thanks, yes I love using my 50mm with my camera. It’s a great little lens. Oh my, this looks so good, especially with the mushrooms and onions. I actually haven’t had red meat in a very long time, but your incredible photo is enticing me! Thank you Hannah! 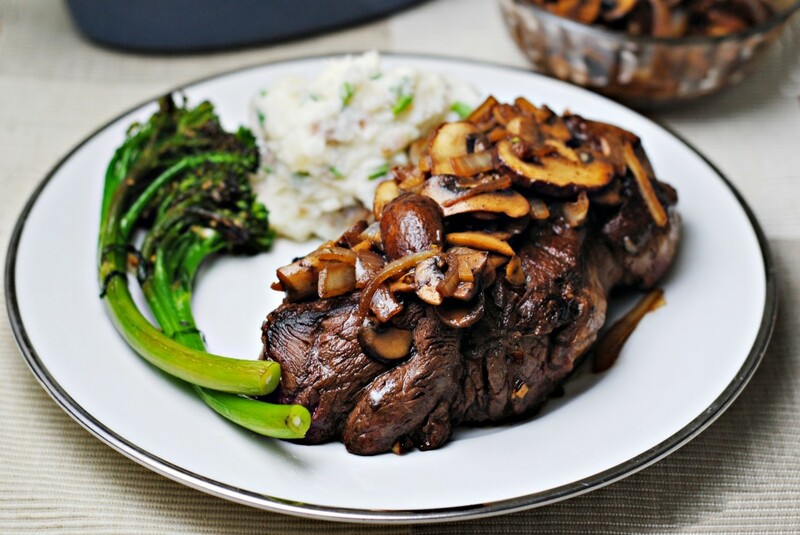 I love steak with onions and mushrooms, I can barely imagine steak without them! We don’t eat that much red meat these days either, but sometimes you just crave a steak! Just made it for dinner and my husband said it tasted like we were at a restaurant. Yay! It was delish. I am usually lazy about leaving feedback, but this was absolutely delicious. The whole family have asked me to make it again. Thank you for posting!! I did try this, and it was amazing! My family and I loved it!! Thanks for a great new recipe to add to “My favorites” cookbook! Such a simple recipe. So falvourful. The only change I made, is that I fried the on ions and mushrooms first and kept them warm in the bottom oven of our aga. Also, I never rest the meat as long as other cooks. This is one of the best steaks we have ever had!!!!!!!! No words can describe how good it is! Oh yay! Thanks so much for the feedback and so glad you enjoyed it.